Hundreds of evacuees are returned home Sunday night as the Willow Fire gets closer to full containment. Hundreds of evacuees have returned home as the Willow Fire gets closer to full containment. 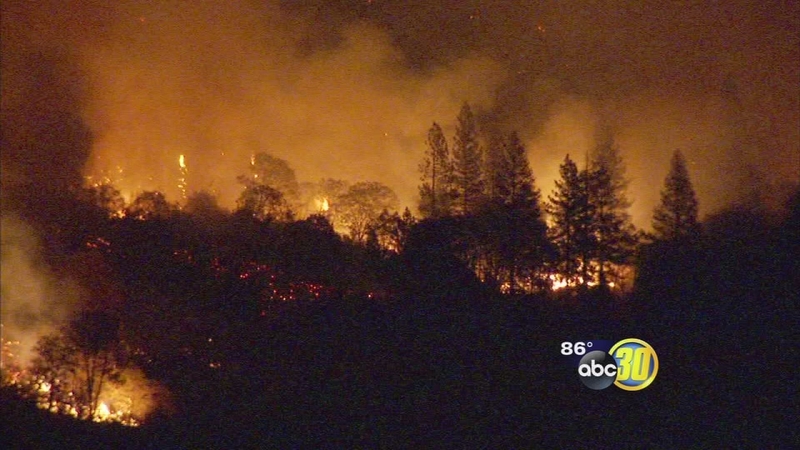 It's now 95 percent contained after burning more than 5,700 acres near North Fork. Eager to get home, cars full of neighbors and animals trucked their way back into Cascadel Woods. "We're excited that they get to go back to their normal life. It's got to be very disruptive being evacuated and they've been living at the evacuation center with family and friends," said Cody Norris of the Sierra National Forest. The Willow Fire that started more than one week ago quickly spread toward cabins and homes forcing hundreds to pack up and leave late last week. "It was scary to leave because you knew the fire was close enough for them to tell you to leave," said Wanda Leon of Cascadel Woods. Leon said sadly they're getting used to drought fueled fires burning in their backyard. "We've been up here for several years we've gone through this several times," said Leon. Officials expect the fire to be fully contained by Saturday, Aug. 15. "Luckily for the Cascadel Woods area a lot of the good containment is right here behind their neighborhood," said Norris. Roughly 300 fire crews were released Sunday night, now that they've got a handle on the Willow Fire. Investigators believe a teen boy sparked the blaze when he was playing with fire and they expect him to face charges. The Willow Fire started last Saturday and has since grown to 5,116 acres. It is now 50-percent contained. The Willow Fire transitioned to a Sierra National Forest Type 3 management organization Friday morning at 6 a.m.
Firefighting resources, such as engines and crews, continue to be released from the Willow Fire and sent to other fires in California. The public is reminded that a lot of firefighting equipment will be traveling on local roads going into the Willow Fire area and others will be leaving the community heading to other incidents. Gaggs, Whiskers, and Whiskey Falls campgrounds are closed.